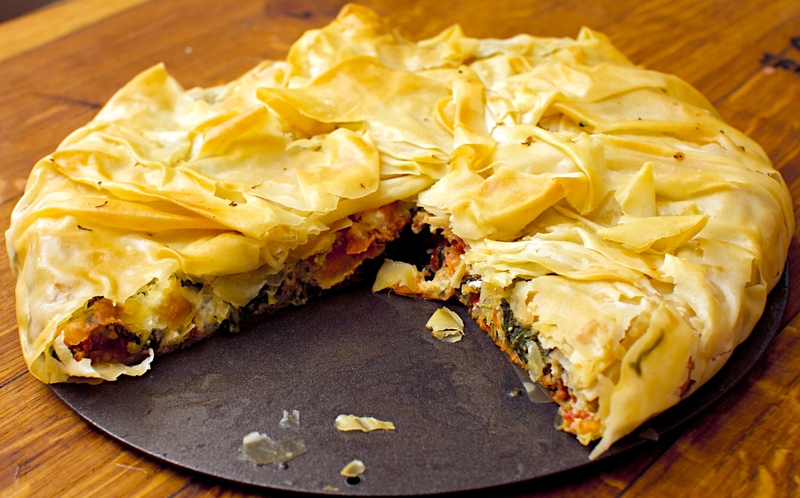 This dish is easily doubled to make two pies, particularly if you are like us and had to defrost a whole packet of filo pastry. 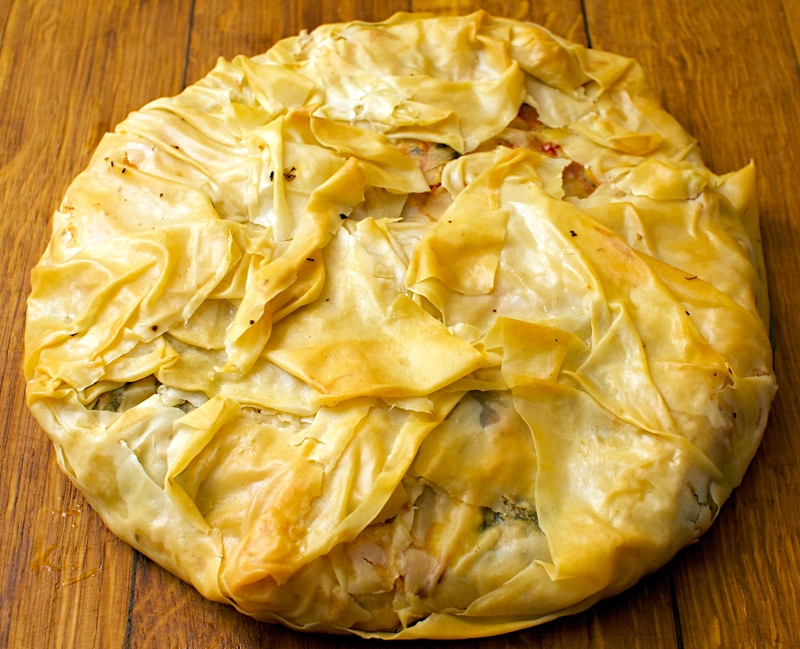 The filo is very forgiving so don’t worry if you’re pastry sheets don’t look too neat and tidy. You could add some cooked chicken if you like things meaty. Put the spinach into a large pan. Add a 2 tbps water, then cook until just wilted. Drain in a sieve, then squeeze out with your hands once it’s cold enough to handle. Roughly chop and put into a bowl. Roughly chop the tomatoes (reserve the oil) and add to the spinach with the feta and eggs. Mix well. Unroll the pastry and be careful not to tear the sheets too much. Cover with some damp kitchen roll to stop it drying out. Take a sheet of pastry and brush really well with some of the oil from the tomatoes. Drape the sheet, oil-side down, in a 22cm loose-bottomed cake tin, leaving some pastry hanging over the sides. Brush another sheet and place in the tin at a slightly different angle. Keep doing this until you have used about 3 of the pastry sheets. Pull the sides into the middle, making sure the filling is totally covered. Brush with a bit more oil on the top if necessary. Heat oven to 180C/fan 160C/gas 4. Cook the pie for 30 minutes or until the pastry is crisp and browned. Slice into wedges and serve with a salad and some tzatziki. Drink with: a glass of Chablis which should have a saline quality to compliment the salty feta.